It is particularly significant for me to write about Trapani, as it is my hometown. In my previous article for Travelicious (click here to check it out!) I gave a general overview of the city’s history and culture, as well as some suggestions for touristic points. But Trapani’s charm is not limited to summertime only: being full of folklore, there is a lot more going on. An example of it are the town events taking place during the Holy Week. 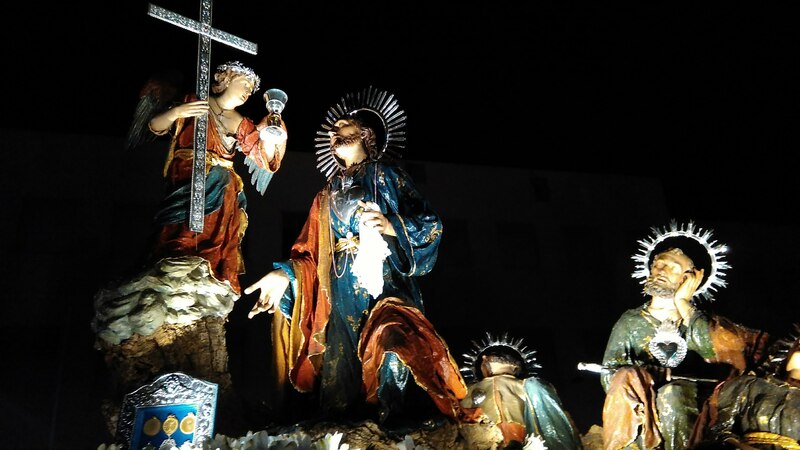 As I suggested in my previous article, Trapani’s Catholic heritage is permeant in the city’s culture, and the folkloristic activities taking place before Easter are part of our oldest traditions. As one may expect, they have a strong religious focus, but only a part of the citizens who take part in them is animated by Catholic faith: indeed, they are mostly religious practices. As I have already mentioned, due to the participation of Trapanese people, they are commonly seen as folkloristic activities. Everyone is welcome to join, and the tourists are usually delighted to. Palm Sunday marks the beginning of the Holy Week. Among all the other celebrations, this one is the most religious one: a procession takes place, with all participants holding palm leaves or olives branches, which recall Jesus’ entry in Jerusalem, and the beginning of His Passion. As the Bible narrates, in when Jesus entered the city, he was welcomed by the habitants waving palm leaves and olives branches at his passage: from that derives the procession tradition. The procession inevitably ends with the I still wanted to mention it in this post though, for people who do not know much about the traditions taking place during the Holy Week. That signs the beginning of the Holy week for Trapanese people. It is a procession starting at Chiesa del Purgatorio, in the afternoon of Holy Tuesday at 16.00. During such parade, a portray of the Virgin Mary is taken around in Trapani’s historic center and surroundings. Is not exactly known when the procession took place for the first time, but for sure it is very antique: the primary documents referring to it strike back to 1850 (more references at drepanon.org). This procession is even more antique than the other, taking place in 1723 for the first time. What is peculiar about it is that once the Icon arrives at Piazza Lucatelli, the “taper exchange” between the Massari and Fruttivendoli, the two fraternities who operates this procession. This is one of the most significant moments of the Holy Weeks for Catholic believers. Sepolcri is the name which refers to the altar displayed in the several churches of the city, which are decorated with wheat seeds sprouted in the dark. This event is strictly connected to Biblical episodes again: the believers converge in the churches in adoration of the Eucharist, in memory of Jesus washing the Apostils feet, and the loneliness in the Gethsemane, the olive grove where he was betrayed and caught. It is a moment of profound faith for many. However, for many other people in the city, it’s just a moment to enjoy a walk in the city center and take a look at the decorated churches. This is the most famous procession held in Trapani for the Holy Week. I Misteri are 18 groups of simulacra of Jesus Christ and the Lady of Sorrows. The 79 statues, which represent 18 moments of The Passion, they have been created by Trapanese craftsmen in ‘600 – ‘700, using wood, glue, and fabric. They are real art pieces. During the procession, the statues are carried along the streets of the city center by volunteers who carry the floats by hand, with the typical swinging movement annacata. The procession is big, accompanied by a band, believers holding candles and so on. It is a very involving moment, even if you’re not a religious person. Click here to watch part of the procession! The procession starts at 14.00 PM on Good Friday afternoon, in the Chiesa del Purgatorio, where the statues are kept during the year. The parade is long, and many streets of the center are sealed off from traffic for the occasion. The simulacra are brought around all night long, coming back to the Chiesa del Purgatorio di almost 24 hours after their departure. Taking part to the whole procession can be extremely tiring. Still, on Good Friday there is one more event taking place in Chiesa Santa Maria di Gesù: the descent from the cross, popularly known as “a scinnuta ‘cruci di Santamariagesù.” This representation was introduced by the Jesuits in ancient times; it is a commemoration of Jesus’ deposition from the Cross. It takes place almost at the same time with the beginning of the Misteri, but until the ’60 the procession was allowed only after the commemoration’s ending. The events consist in the deposition of a simulacrum of Jesus from the Cross, which is then enveloped in a white sheet and adored by the believers. There is no specific event taking place on Holy Saturday, being it the day of mourning for Jesus’ death, and as regards Easter there is not much special to say: believer families go to Church to attend the Mass, and then everyone has lunch with his family. So, I’ll go straight to Easter Monday: Pasquetta’s barbeque! It is a tradition for Sicilian people on Easter Monday to have a huge barbeque with families and friends: sausages and bruschette and carcocciole (artichokes) are the main dishes. If the weather is good (as it is often), it’s gonna be a great moment. There are plenty of places where to go in Trapani’s countryside for Pasquetta, but the most famous and convenient one is probably Bosco Scurace. It is a bit far from the city, but there you’d find pick-nick areas and free barbeques available, you’d only need to bring the wood, your food and enjoy the day. You might want to make sure not to leave too late because you might find the place already too crowded. I enjoyed writing this post so much; it’s a pleasure to write about my hometown and what makes it so unique 😊 hope to see you all next year, write me your feedback in the comment below!